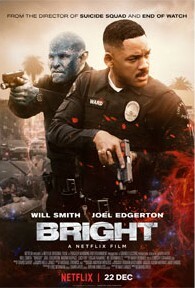 Enter Bright, another Netflix original movie but this time with Will Smith attached to the project. The movie didn't just get a big push on the servicec itself, but we also saw a lot invested in advertising to push folks to watch it. Critical response wasn't too favorable, but it was naturally followed by social media support claiming it wasn't so bad, but I figured the reality was somewhere in-between. But that still get me all that excited to watch the movie since it was a whole new IP coming out of nowhere. And that's always tricky. Synopsis: Bright is a Netflix original uriginal fantasy crime movie directed by David Ayer. The screenplay was written by Max Landis. In an alternate version of Earth where humanity lives alongside various classic fantasy creatures including orcs, elves, and all that fun stuff. Thus in this version of Los Angeles we start to follow around another close to retirement cop, Daryl Ward (Will Smith) is assigned the orc Nick Jakoby (Joel Edgerton) as partner as sort of political statement. Ward is annoyed by the assignment and never hesitates to let his new partner know of his displeasure. Eventually the two are sent to investigate a disturbance at what is later determined to be a Shield of Light safe house. There's been a massacre inside and the only survivor appears to be a young elf girl, Tikka (Lucy Fry) who appears to be in possession of an actual magical wand - something that is treated like a Weapon of Mass Distruction in this world. It is said that such wands can only be controlled by a "Bright", somehow born with this ability to control magic. Non-Brights touching a wand are more than likely going to die. What I Liked: Obviously the production value for this is pretty out there ranging from the quality of the make-up for the magical creatures and then you have the magical stuff which is visually appealing. Whether it's a dying elf somehow splattered against a wall or the welding-like dripping effect whenever people use the wand all come together for some pretty compelling stuff. And obviously the story structure presented magical creatures as ethnic minorities and there were obvious parallels to modern-day race relation problems in various cities in America. In that respect you can sense efforts by the writers to say something there, even in a rather subtle manner. What Could Have Been Better: The movie features a heck of a number elements that feel familiar from other movies and mashed together to create this piece. Thus you have the tropes of the unwilling partnership between cops transitioning to the later earning each other's respect routine. Plus you have how magic is limited by the genetic lottery somehow and too much seems like stuff you've seen before a number of times. All together the story is a little odd but not terrible. It's a confused collection of vignettes with driving scenes filling in the gaps. It doesn't come together be all that sensible nor is the final resolution to the various plot elements all that satisfying. It just ends and their magical world continues on without us beyond the credits sequence or something. TL;DR: Bright isn't necessarily a bad movie but perhaps more an unexceptional one that doesn't really say anything new. It looks good from afar but doesn't really hold up once you try to get more involved with its paper thing story. Thus it only gets 2 magical creatures living in downtown Los Angeles out of a possible 5.